Pi Super Yachts has released details on a range of trimaran sailing superyachts, starting with the 80m flagship vessel, the Dragonship 80, an aluminium 80 metre, five-deck, three-masted trimaran yacht. Pi Yachts commissioned McPherson Yacht Design to develop a new range of sailing trimarans aimed at the luxury end of the yachting market. Starting with the Flagship of the fleet, the brief was to create a style that was elegant and in-tune with what a superyacht client would expect of a vessel of this size, while also maintaining a sporty image. 'We looked for a designer with the imagination and creative flair who would produce a design that would easily convert into a realistic vessel, McPherson Yacht Design has done an incredible job. The yacht will be the flagship of our Dragonship range of trimarans that we propose building over the coming years. The range will consist of the 80 metre, a 50 metre, 35 metre and our baby Dragon at just 25 metres,' says Will O’Hara, Director of Pi Super Yachts. The rig is highly innovative and cutting-edge, similar to the wing masts recently used on the America’s Cup AC72 yachts. The system is the brainchild of Jack Manners-Spencer who’s been pioneering his Autosail rig since the 1980s. It does away with the use of sheets for control, instead relying upon a powered rotating mast which supports the aerofoil section sail. 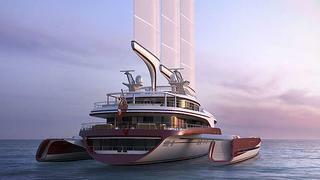 Two rig options are planned, ‘Sports’ and ‘Cruising', depending upon the client’s wishes. Her layout was designed to be charter-friendly, accommodating 12 guests in six cabins and supported by a crew of 17. The main and upper decks are dedicated to social areas which will offer excellent views out to sea. Facilities on the main deck will include the saloon, bar, dining room, library, spa and a gym, all encompassed by a wide promenade offering the sheer luxury of space. Outside dining is catered for at the aft end of this deck, while the foredeck is kept clear as a reconfigurable space that can be populated with loose furniture as desired. The upper deck features the skylounge and has an emphasis on out-door enjoyment. A large exterior bar overlooks the Jacuzzi and spacious sun-pads. This area can also be shielded from the sun by the built-in awning system. Forward of the bridge is another large exterior seating area including a bar/TV cabinet which leads on to open deck space for sun-loungers. Exterior helm stations are located on the fifth, upper-most deck and boast commanding views of the rig and offer clear views out to sea . This deck also provides seating and a bar for guests to share in the thrill of helming this powerful, graceful vessel.